There is no doubt that Altyn Orda enjoys “home matches” in Newmarket, whether it be on the July Course or on The Rowley Mile. She chased home Alpha Centauri in the Tattersalls Falmouth Stakes in July and, on her latest start, she was a fine third to Laurens in the Kingdom of Bahrain Sun Chariot Stakes. 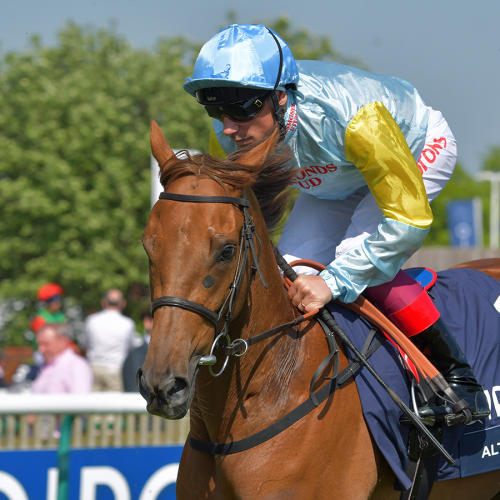 Altyn Orda was no match for the brilliant all-the-way winner in the Falmouth but it was still a fine effort from a filly whose other efforts at Newmarket have included a win in the Group 2 Oh So Sharp Stakes as a two-year-old. “She has run a huge race and bounced back from a disappointing run in France [the only time she has not run at one of the Newmarket courses],” Varian said. “She is talented, she’s Group One-placed, and on the back of that, we can dream about winning at the top level with her, can’t we? On her penultimate start, she beat only one home in the eight-runner Group 2 Celebration Mile at Goodwood but she was beaten less than three lengths in a tight tussle won by Beat The Bank.